When you return your shirt, this is free of charge when you send it back from the Netherlands. Use a similar package as the one you received it in, which fits through a regular mailbox. When you return your package from outside the Netherlands, the shipping costs will not be reimbursed. 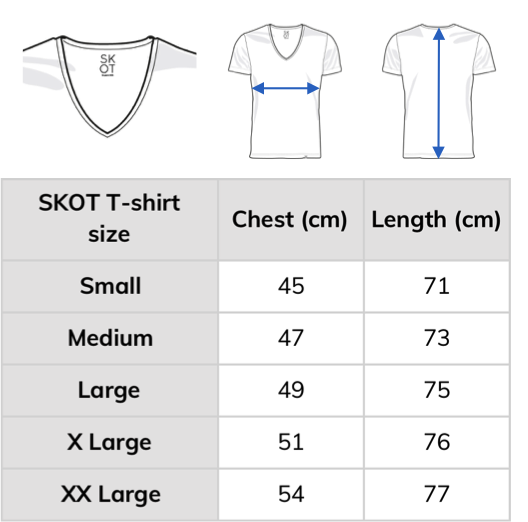 We will deliver your SKOT shirt in 2 days when ordered in the Netherlands. Order on Monday, and you get it on Tuesday or Wednesday at the latest. When you order on Saturday, you’ll get the package on Monday. When you order your shirt from outside of the Netherlands, expect 3-10 days for delivery. When we send the package, we’ll give you a notification by email with a track&trace code. This way you can follow the delivery of your package yourself. When we send the package, we’ll give you a notification by email with a track&trace code. This way you can follow the delivery of your package yourself. If your track&trace code doesn’t work, or if the delivery doesn’t happen on the indicated date, please contact us. We’re happy to help. Send an email to hello@skotfashion.com. Go to www.skotfashion.com and sign in with your account information. Select the product that you wish to return, and indicate that you want to exchange your shirt. Select the shirt you wish to like to receive in return. Print the address label and attach it to the original package. Don’t worry about including the clips or the tissue paper, it’s just about the SKOT shirt. If you don’t have the original package anymore, just use every other parcel which fits through a regular mailbox. Exchange within 30 days. Free shipping costs for returns in the Netherlands. Go to www.skotfashion.com and sign in with your account information. Select the product that you wish to return, and indicate that you want to return your shirt. Return within 30 days. Free shipping costs for returns in the Netherlands. If you would like to return your unaltered and unworn shirt after 30 days, we think you’re either very lazy or very busy. We offer an exchange or another shirt, or you can choose a gift voucher for our online shop. This voucher is valid for 1 year. CAN I PICK UP MY SKOT SHIRT PERSONALLY? Of course! Even as an online shop we’re happy to personally help customers. You can try several shirts to find your right fit, or just pick up your order when you are in the neighborhood. Just send an email to hello@skotfashion.com. WHERE CAN I BUY SKOT SHIRTS? You can buy SKOT shirts in our webshop only. We currently don’t sell our shirts through retailers. Sometimes we are present at events and we may sell our shirts at location. Check our Facebook page or sign up for our newsletter to receive updates on planned events. HOW DO I CLEAN MY SKOT SHIRT AND TAKE GOOD CARE OF IT? Please check our care instructions page. WHAT MATERIALS ARE SKOT SHIRTS MADE OF? Please check our fair materials page. WHERE ARE SKOT SHIRTS PRODUCED? Please check our fair production page. WHAT IS THE DIFFERENCE BETWEEN NORMAL AND ORGANIC COTTON? Organic cotton is grown without the use of chemical fertilizers, pesticides and insecticides. Pesticides pollute soil and water, killing wildlife and harming communities. With organic agriculture natural fertilizers and fertilizing techniques are used instead, including compost, manure, naturally derived mineral and plant fertilizers, and crop rotation. A staggering 25% of the world’s total amount of pesticides is used in the cotton cultivation industry. On average that means every non-organic shirt has 200ml of chemicals on it. That is a toxic drink that SKOT is happily turning down. WHEN WILL THERE BE A NEW COLLECTION OF SKOT SHIRTS? Just sign up for our newsletter in the footer below. You’ll receive priority updates on the selection and the launch date of our new collection. HOW DO I RETURN MY SKOT SHIRT FOR A 10% DISCOUNT? After a long lasting friendship, don’t feel hard about it. We give you 10% off on your next shirt purchase. No matter how long you have worn your shirt. Send us an email to hello@skotfashion.com and indicate that you wish to return your shirt to exchange it for a new one. We’re happy to help with the ordering and logistics process. We partnered with a third party payment provider, Mollie. This company has a great track record in safely processing online payments. You can check the status of your order by logging into your account on our website. You’ll get a confirmation email once you have placed the order. You’ll get another email when the package is shipped. 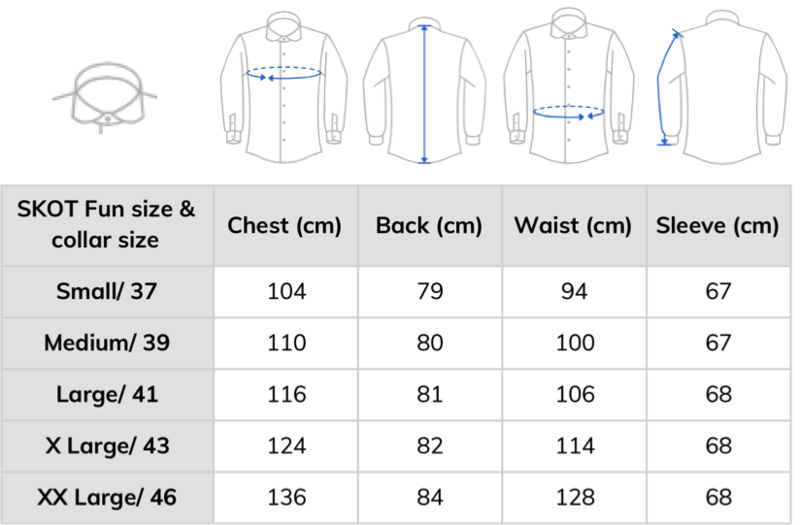 In this email you will receive a track&trace number, through which you can track when your shirts will arrive. We prefer payments with IDEAL. This is the fastest and cheapest option. Other payments we accept are Paypal and credit cards such as Visa, MasterCard and American Express. I DID NOT GET MY CONFIRMATION EMAIL, NOW WHAT? Once you have placed an order you will automatically receive a confirmation email. If you didn’t receive it, check in your spam folder or in your deleted items folder. Still didn’t find it? Contact us on hello@skotfashion.com. We’re happy to help. Once you have completed the return process and the shirts have been received back by SKOT, we’ll refund the payment amount within 1-5 working days. SKOT stands for Treasure. Treasure the world, the people who make your shirt and the ones smiling at you. Treasure the product. SKOT is Frysian, just as I am, and it reminds me every day to stay close to my roots. WHY IS A SKOT SHIRT SUSTAINABLE? HOW DO I CONTACT SKOT? Don’t hesitate to send us your question of give us your comments. Check our contact section.